for Laser and Inkjet Printers, 3½" x ⅝"
Make file folders stand out with a professional look. These Print or Write File Folder Labels feature a strip of eye-catching colour at the top to make it even easier to find just the folder you're looking for and are great for colour coding. Make file folders stand out with a professional look. These Print or Write File Folder Labels feature a strip of eye-catching colour at the top to make it even easier to find just the folder you're looking for and are great for colour coding. Write on the labels by hand or use the free templates available to format them easily on your computer and print them with your laser or inkjet printer. The permanent adhesive ensures that your label will stay put without curling away. For a truly standout design, it's hard to beat these convenient labels. 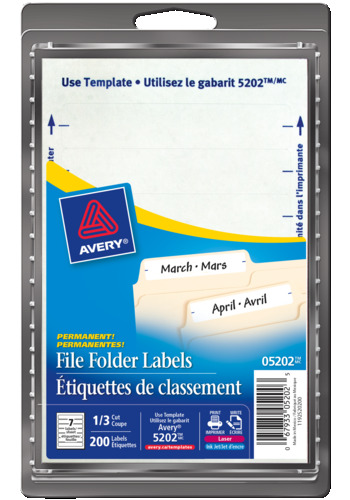 Label Size 3½" x ⅝"
Keep important documents organized. Easily find tax receipts, files, paperwork, recipes, photographs, and more. Identify critical files, accounting receipts, correspondence, and more, while keeping your filing cabinet neat and organized. Organize assignments, homework, tests, exams, and keep student's work consolidated and labeled to easily find.